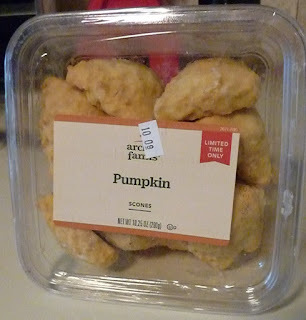 From the very beginning, Sonia and I have had a difficult time finding Archer Farms brand pumpkin products at our local Targets in the PA, DE, NJ region. We've found pumpkin pancakes, pumpkin oatmeal, pumpkin salsa, and pumpkin coffee so far—which isn't bad, but we see TONS of other Archer Farms pumpkin goodies on Instagram, Twitter, and Pinterest. We figure it's just a regional thing. Or maybe our Targets sell out of things like Pumpkin Spice Monster Trail Mix very quickly. At any rate, Sonia was delighted to discover these scones at a Target near her workplace. 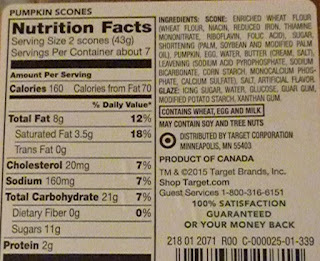 I pretend I'm too manly to get excited about pumpkin stuff around this time of year, but on the inside, I start giggling and quivering with glee when I see things like pumpkin scones. Granted, not all pumpkin products are super tasty. But most things we've found at Target are pretty decent. And that's definitely the case with these. The taste is great: a sweet, bready, pumpkinny flavor. 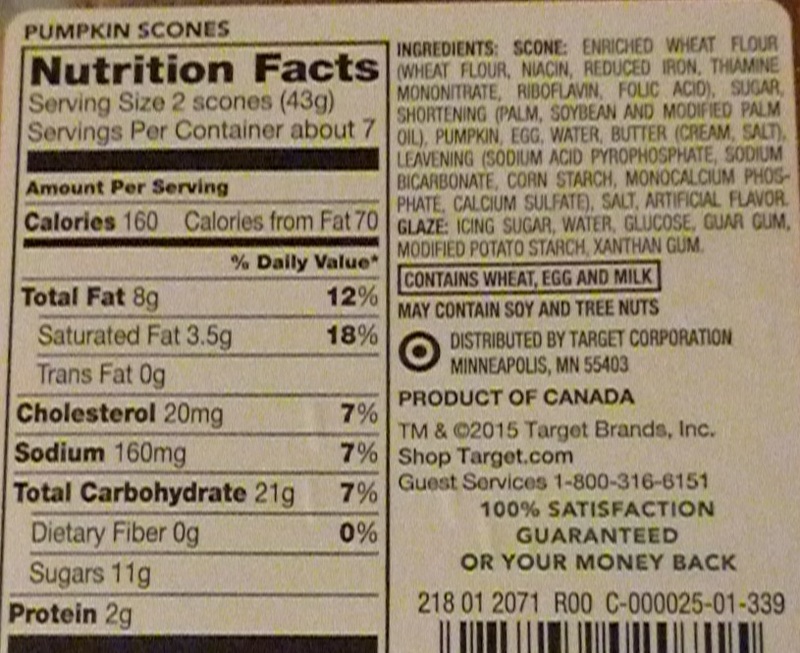 It's got a decent amount of pumpkin in the ingredients, and you can actually taste it. And no, I don't mean pumpkin spices. There's, like, actual pumpkin in here! But my favorite part of these things is the texture. There's a freshness "sell-by" date sticker on the front of the package, and you can absolutely tell these haven't been sitting on the shelf for weeks or months. They're nice and soft—almost to the point of a "melts-in-your-mouth" kind of vibe, with a slightly-firm sugary shell on the outside. The only thing that could be better would be fresh-made scones from scratch, homemade or from a bakery. 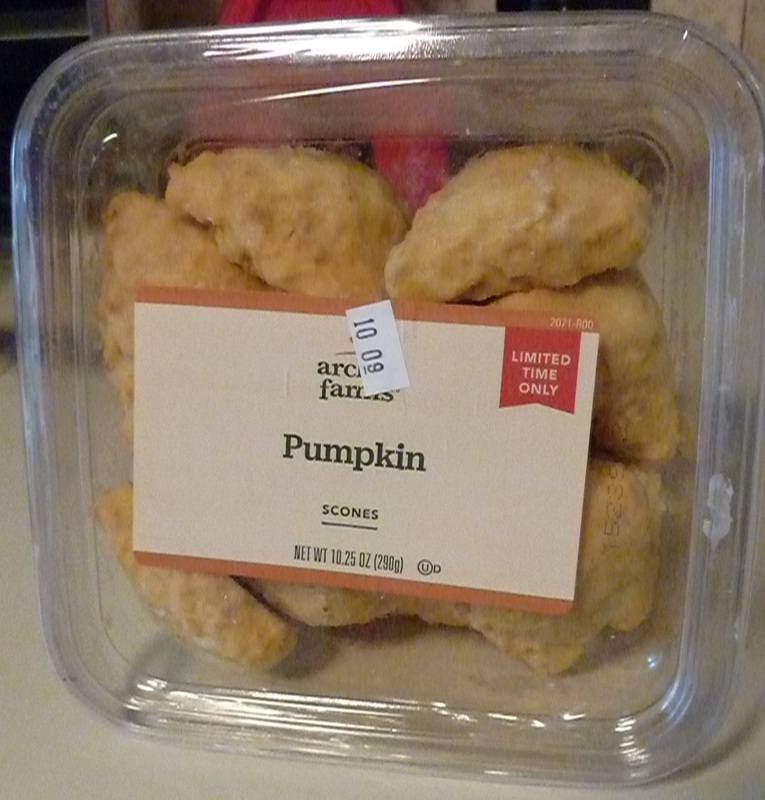 As long as you like pumpkin—and I mean, you actually can taste some real pumpkin—I think you'll like these. Granted there's plenty of traditional wheat flour and sugar taste in there, too. But it blends well with the moderate levels of pumpkinosity.